Great news today from the Northern Plains Resource Council (NPRC). Water stealing from the gravel pit at the well site in Belfry has been stopped by the Montana Department of Natural Resources and Conservation (DNRC). The agency has informed the landowner that he does not have the right to sell this water to ECA. There have been a number of dramatic developments in this story today. This morning ECA issued this statement, reported by Ed Kemmick on Last Best News. 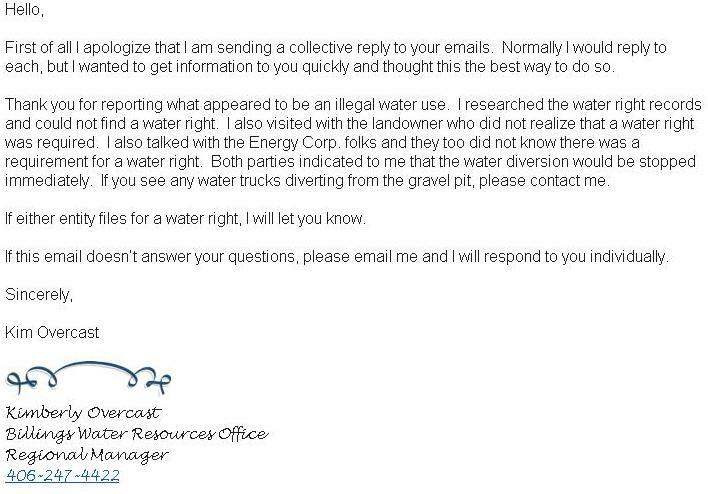 “Energy Corporation of America (ECA) is working with a local vendor to purchase water for our operations. It is our understanding that this particular vendor has an agreement directly with a surface owner in the area who has a gravel pit on his property that has filled with water. Under their agreement, the vendor draws water from this gravel pit, which he then transports and ultimately sells to ECA. “It is important to note that the location in question is simply a gravel pit that has filled with water. There are no surface streams or other water sources running into or out of the gravel pit. Then, according to NPRC, the DNRC called ECA and told them the water was from an illegal source, and they couldn’t legally use it. ECA rep Seth Nolte asked the DNRC, “Well then what are we supposed to do?” and DNRC told them they could either drill their own small well or get it from the townships. Great news. Local neighbors set this process in motion when they spotted the violation, photographed it, and brought it to the attention of the DNRC. Thanks to Northern Plains members, readers of this blog and the Facebook page No Fracking the Beartooth Front, the DNRC was deluged with calls and emails. Based on click-throughs on this site, at least 26 people emailed the DNRC, and many more people on the Facebook page indicated they had called or mailed. Aside | This entry was posted in Community Organization, Politics and History and tagged action, Belfry well, Montana Department of Natural Resources and Conservation, Northern Plains Resource Council. Bookmark the permalink. Happily, it does appear that our voices are being heard. But, that means that we need more voices next time. We cannot relax and assume that any agency or department cares as much about our counties, valleys and towns as we do. We need hundreds of letters for each incident. Thank for keeping us in the know.